As if water resource managers don’t already address a variety of dynamic variables that impact water demand, availability of supply, and water quality, climate change introduces a new set of planning challenges. Rising temperatures, drier conditions, snowpack loss, flood events are observed across the U.S. However, climate change impacts individual communities and local water utilities differently. For instance, extreme precipitation events may increase the amount of sediment suspended in water. The increase in turbidity may exceed water treatment plant capabilities, posing little threat to updated pre-treatment filtration systems or shutdown older facilities. Water utilities are strongly encouraged to conduct vulnerability assessments to identify their exposure to climate change and more importantly, to strengthen their capabilities to anticipate, respond to and recover from multi-hazard threats with minimal damage to people, environment and the economy. And yet a 2017 Water Research Foundation study, Insights into the Use of Uncertain Information in the Water Utility Sector, found that more than half of the 250 professionals surveyed don’t believe they have the understanding they need to gather, use, and share uncertain information (Raucher and Raucher). New findings by The Water Research Foundation reveal state governments can contribute to local understanding, preparation for the effects of, and resiliency to climate change. The 2018 State Survey of Climate Change Resiliency Efforts reports that states may provide funding and/or technical assistance to water utilities, in order to promote sustainable management of water resources. In particular, state climate adaptation / mitigation / resiliency plans can provide a comprehensive strategy for better understanding and preparation for more specific impacts of climate change on water resources. not many state-level programs to directly assist water and wastewater utilities. Inter-agency cooperation as well as information sharing via new or integrated data systems are establishing the bigger picture that’s needed to address challenges of this magnitude. Partnering with private sector developers of off-the-shelf software has helped state agencies save time and development costs. Technology like Water Information Systems KISTERS (WISKI) not only consolidates data collected over various administrations, but it increases the integrity of information as standardized quality control rules are evenly applied. In addition, users are now able to see and identify trends over longer periods of time, investigate seasonal phenomena, and even examine specific time periods of interest or data from select monitoring sites. Leading states — Oregon, California, and Minnesota to name a few with which KISTERS' software supports — have a formal, stand-alone climate action, adaptation, or resiliency plan that features water resource management. States like Idaho have documents such as water supply and/or drought plans. Oregon has multiple state-level plans related to climate change and its 2017 Integrated Water Resources Strategy takes into account climate change, as is required by Oregon Revised Statute 536.220. The same policy requires the strategy to be updated every five years, and the Oregon Global Warming Commission issues a report every two years to the Legislature. California has a particularly robust plan with a large focus on water resources, and several water agencies are involved. It requires the Natural Resources Agency, in particular, to track progress toward action items in a climate adaptation plan. AB1482 requires an annual report to the Legislature on actions taken to implement the Safeguarding California Plan, which lists next steps, ongoing actions and initiated or completed programs. More than 60 action items fall under 10 overarching water resource management goals. Minnesota first released The Adapting to Climate Change plan in 2010. Updates were published in 2013 and again in 2017. Additional water resource management goals include groundwater sustainability while additional water supply-related impacts include reduced lake ice cover during winter, more intense rain events with flooding and greater sediment and nutrient loads. While Idaho does not have a stand‐alone climate action, adaptation, or resiliency plan, its 2012 State Water Plan has a section on climate variability. At the time of the survey, Missouri had neither a climate plan nor other water-related plan. However, the Show-Me State has recently implemented KISTERS’ technologies to move toward a more integrated water resources strategy through more efficient management and in-depth analysis of information pertaining to hydrology, water quality, and biology. No state tracks progress related to specific water resource resiliency benchmarks, but state‐level climate change resiliency efforts will likely increase and improve over time. 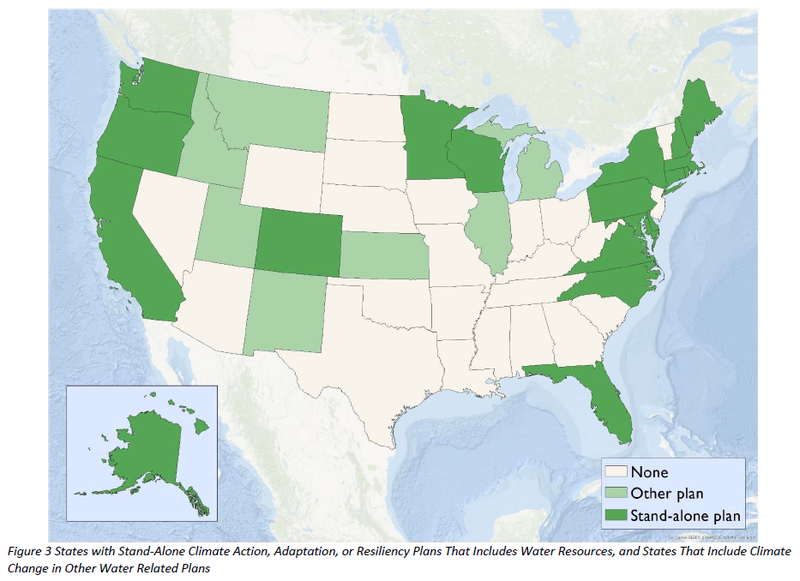 Of note, no state has specific requirements of water or wastewater utilities connected to its climate adaptation plan. No statue mandates vulnerability assessments, submission of climate change adaptation plans, or implementation of adaptation strategies. 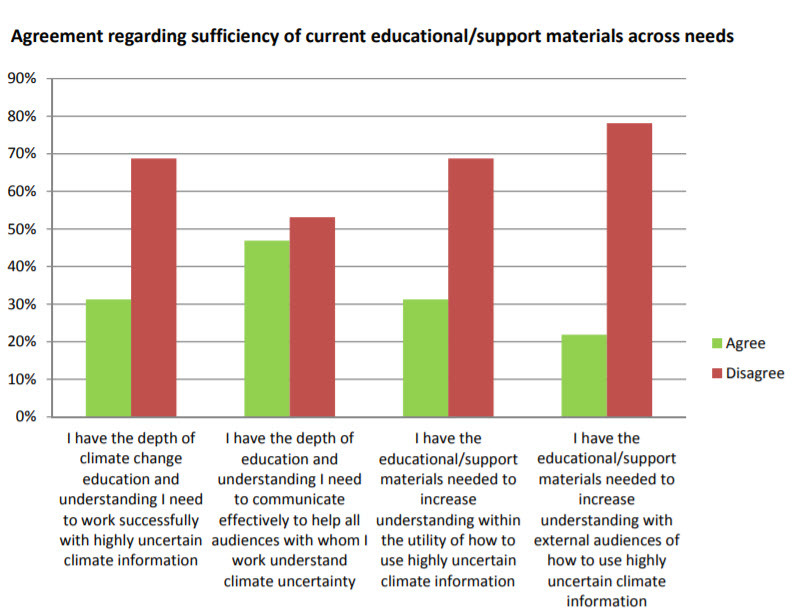 Download the State Survey of Climate Change Resiliency Efforts.